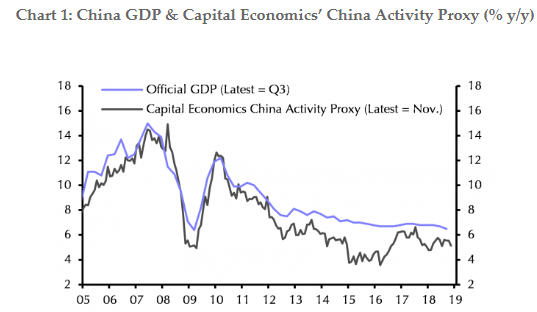 Capital Economics are out with two important reports on the latest trade figures and state of the economy in China. Yesterday’s trade numbers for December shocked to the downside, and Capital’s view aligns with Houses and Holes that any slowdown in the Middle Kingdom’s economy is part of its structural re-alignment and not external ie: the Trump trade war. The market sell-off in the final weeks of last year was driven in part by fears about an over-zealous Fed, but also by growing concerns about the health of China’s economy. So is it time to worry about China again? Part of the problem is that a lack of reliable data on China’s economy means that investor sentiment can shift on events that would barely cause a ripple in most other countries. The latest bout of market jitters followed a warning from Apple that its revenues would undershoot, due in large part to softer demand in China. Yet despite Apple’s troubles, Huawei – the Chinese electronics manufacturer – appears to be doing well. The recent turbulence has echoes of 2015-16, when sharp falls in China’s equity market led many global investors to conclude (wrongly) that the economy was suffering a “hard landing”. A repeat of that panic seems unlikely today. Equities have been falling again over recent months but less dramatically and without triggering broader concerns about the financial system. The renminbi is also under less pressure. Foreign exchange reserve data published last week suggest that, while the People’s Bank is intervening to support the currency, the scale of intervention is extremely small and much lower than in 2015-16. We use our proprietary China Activity Proxy (or CAP) to track shifts in China’s economy without having to rely on the official data. It shows that growth is slowing but not collapsing. (See Chart 1.) 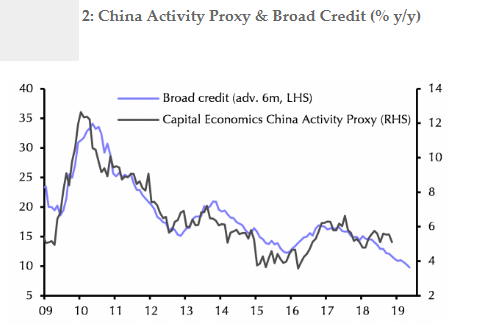 Interestingly, this slowdown has been due to domestic headwinds – including tighter credit conditions – rather than “trade wars”. December’s trade data (released today) were soft, but the data for the preceding months were surprisingly strong and show exports to the US growing at a decent pace, which may reflect producers trying to front run any future escalation in tariffs. We expect growth on our CAP measure to slow further over the first half of this year. The weakening of credit growth over the past six months or so is consistent with economic growth dropping to around 4% by mid-2019. (See Chart 2.) At the same time, a weaker global economy means that Chinese exports are likely to soften even if a trade truce is agreed. Both fiscal and monetary policy have been loosened over the past few months and this should start to feed through to the real economy by the second half of this year. However, the scale of the stimulus so far has been more limited than in 2015-16, and the effect on activity is likely to be correspondingly smaller. We think growth on our CAP measure will stabilise at around 4.0-4.5% y/y towards the end of this year, but we don’t expect the same bounce in growth seen after an injection of stimulus in 2015-16. All of this means that, while China’s economy isn’t facing an imminent collapse, neither is it in a particularly good place. Growth in 2019 is likely to be weaker than in 2018 and this will play a significant role in the coming global slowdown. We estimate that slower growth in China will shave about 0.2%-pts off world GDP growth this year compared to 2018. Moreover, cyclical weakness will draw attention back to China’s structural challenges, many of which have continued to deepen. While most analysts focus on the dangers of financial instability from credit expansion, in our view the bigger concern is the growing misallocation of resources that has accompanied the rising debt burden. As we’ve discussed before, in the absence of a radical shift in policy direction, this could drag potential GDP growth to as low as 2% by the end of the next decade. So while Trump, trade and the Fed look likely to be the dominant market themes in the early months of this year, investors should keep at least one eye on what’s happening in China.